As a whale watching tour heads home in Weyton Pass off Northern Vancouver Island, a lone male Orca surfaces beneath the beautiful sunset sky. Weyton Pass off Northern Vancouver Island in British Columbia, Canada is often a good place to spot Orca as they make their way in and out of Johnstone Strait. On this particular day as the sky is aglow during the sunset hours, a male Orca surfaces nearby a whale watching tour heading home for the evening. The tall dorsal fin is a sure sign that this Orca is a male as the fin on a female is much smaller. Being the tallest cetacean in the world, the male's fin can grow to up to 6 feet in height while the female's reaches about 3-4 feet and are usually slightly curved towards the whale's back. The Northern Resident Killer Whales are divided into pods and sub-pods and are easily identified by many of the boat captains who see these Orca on a regular basis during the summer and fall. The male is traveling alone in this picture, but the rest of his pod will not be too far away and one call by the matriarch will bring them together to continue on their journey through Weyton Pass. 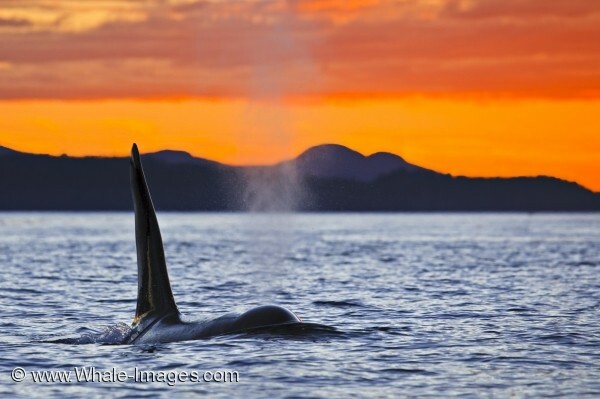 This picture is one that's hard to beat as the mist lingers above the Orca mixing in with the colors blanketing the sky as the sunset lighting reflects off his shiny, black body. Various whale watching tours are available around Northern Vancouver Island and this is one of the best ways to capture these beautiful animals in their natural habitat. The sunset tours are some of the prettiest, especially on nights when the ocean is calm, the sky is a mix of fiery colors and the blow of an Orca can be clearly heard as most of the marine traffic has headed home for the day.